LOT 66 is a beautiful corner lot in St. Augustine's new beachside neighborhood. 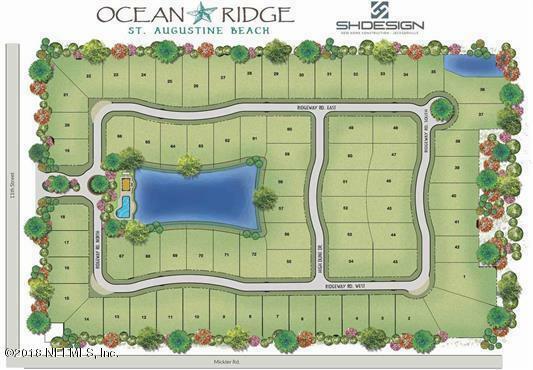 Ocean Ridge is a community of 72 homes set amongst beautiful oak canopied roads and just a few short blocks to the non driving beach at the end of 11th St. Lot 66 has views of the lake and is very close to the community pool and cabana house. Walk or bike to the great restaurants and shops along A1A. Very low HOA fees in this McGarvey Residential development make it a great choice to build your dream beach home.Ocean Ridge is the last new neighborhood to be built at St. Augustine Beach. Don't miss this opportunity. Lot loans available through sellers preferred lender.